Our 2019 PB Hobo is our sixth Hobo release. 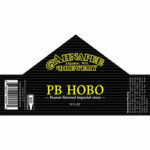 PB Hobo is a Peanut butter infused Imperial Stout. Join us for the release on May 4th 2019 starting at Noon! Our 2018 High Five Hobo is our fifth Hobo release! 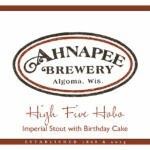 To celebrate our fifth anniversary we added birthday cake to the mash of our Imperial Stout for a one of a kind brew. The balance between the light aroma of yellow cake and the chocolate, roast character of the Imperial Stout is paired perfectly with friends! Our 2017 Hobo release. Our Fourth Hobo is a Whiskey Barrel Aged Barley Wine. A Hobo Called Barley has balanced oak and ripe fruit from aroma to finish. Malty body leads to a prompt finish. Our 2014 Hobo Release was the first Hobo Beer release, named simply The First Hobo. Ripe fruit and citrus are complimented with baking spices, molasses and gingerbread. This Quadrupel Abbey Ale, is sweet mid-palate yet finishes dry with warming alcohol. Our 2015 Hobo release. Smokey Hobo is a whiskey barrel aged, Peat Smoked Imperial Porter. Smoked and roasted malt meld together to create a complex malt experience with a slight whiskey barrel finish. Our 2016 Hobo release. 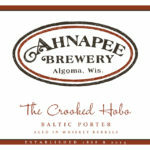 The Crooked Hobo is a Whiskey Barrel Aged Baltic Porter. Whiskey, oak and vanilla aromas mellow to a balanced chocolate, oak and roast flavor. A lingering finish of oaked-coffee.